We can find just the right property for you! Life in Greece is relatively stress free and often quite rural, especially on the Greek Islands. Also the weather conditions are good as there is almost always sunshine, also in winter. And when you compare the prices for real estate at home with those here in Greece they usually turn out to be much lower, which makes owning a property or piece of land a very attractive investment for personal or business use. In our pages you will find a variety of houses, land, villas and businesses for sale so please take your time to look around and contact us if you would like to receive more information and discuss your personal opportunities for owning your unique space here in Greece. Interested in a home-away-from-home, a traditional stone house with seaview, a renovated estate in Eressos, a quiet piece of land in Kambos, or maybe a house in Mytilini? Contact us now to discuss your possibilities. Your dreams ARE our real(i)ty! 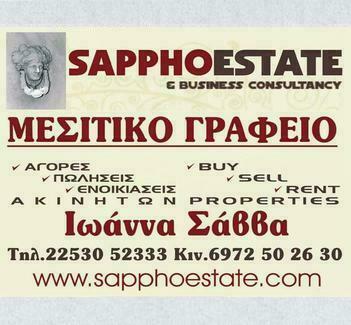 When you are looking to buy real estate in Lesvos Island there are a number of options available to you. Value estimates to help you understand what your property is worth. Advice on the process, costs and jobs to be done when selling your property. Interested renting a property long term? Let us advise you on the different options available.